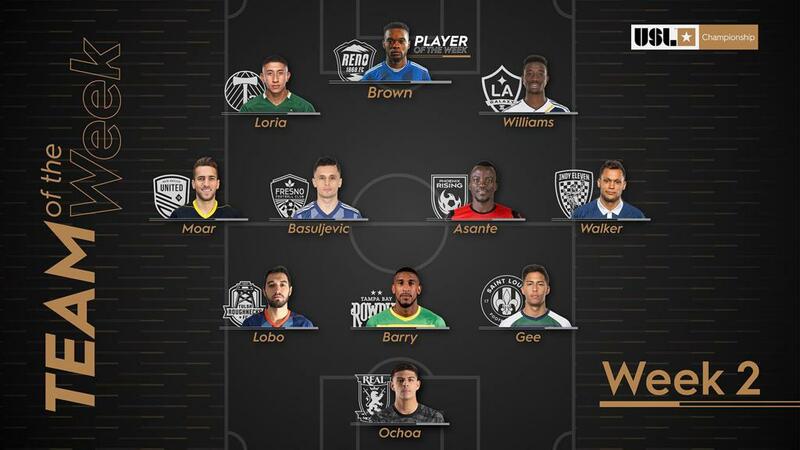 TAMPA, Fla. – Reno 1868 FC forward Brian Brown has been voted the USL Championship Player of the Week for Week 2 of the 2019 season. The Jamaican forward continued his strong start to the new campaign as he scored both goals in 1868 FC’s 2-1 comeback victory against Austin Bold FC at Greater Nevada Field on Saturday afternoon. Brown received 38 percent of the poll conducted by a national panel of independent media representing every USL Championship market, narrowly edging out Tulsa Roughnecks FC defender Luca Lobo on 33 percent after Lobo’s two-goal performance in the Roughnecks’ 5-3 win against Orange County SC. GK – David Ochoa, Real Monarchs SLC: Ochoa posted a nine-save shutout to earn the Monarchs a point in a 0-0 draw with El Paso Locomotive FC despite the hosts being down to 10 men for almost an hour. D – Luca Lobo, Tulsa Roughnecks FC: Making his professional debut, Lobo struck twice in four minutes as part of the Roughnecks’ run of five unanswered goals that earned the side its first road win since September 2017. D – Shawn Barry, Tampa Bay Rowdies: Barry recorded a goal and assist while contributing to the Rowdies’ shutout defensively in a 2-0 win against Pittsburgh Riverhounds SC. D – Paris Gee, Saint Louis FC: Gee played a key role in locking down Nashville SC’s attack, recording three tackles and two clearances as STLFC limited the hosts to one shot on goal in their 1-0 win. M – Santi Moar, New Mexico United: Moar scored a pair of spectacular solo efforts as New Mexico came close to spoiling Phoenix Rising FC’s home opener in a 3-3 draw at Casino Arizona Field. M – Arun Basuljevic, Fresno FC: Basuljevic scored twice to lead the Foxes to a 2-0 victory on the road against Rio Grande Valley FC for their first win of 2019. M – Solomon Asante, Phoenix Rising FC: Asante converted twice from the penalty spot and recorded five key passes, while also completing 27 of 33 passes overall in Rising FC’s 3-3 draw with New Mexico. M – Kenney Walker, Indy Eleven: Walker notched a pair of assists and four key passes overall to help Indy claim its first victory of the season on the road against the Charlotte Independence. F – Marvin Loria, Portland Timbers 2: Loria struck twice and recorded two key passes as T2 earned an impressive road victory against San Antonio FC. F – Brian Brown, Reno 1868 FC: Brown notched both goals as 1868 FC rallied in the second half to take a 2-1 victory against Austin Bold FC for its first win of the season. F – Augustine Williams, LA Galaxy II: Williams scored his first two goals for Los Dos as it romped to a 3-0 victory on the road against Tacoma Defiance. ©2019 Birmingham Legion FC / SportsEngine. All Rights Reserved.